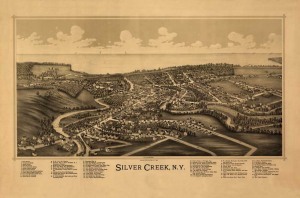 From the Library of Congress, keeper of unbelievable treasures, come these richly detailed bird’s-eye-view drawings of western New York villages as they looked in the late 1800s. Every road, building, and natural feature is meticulously rendered and now resurrected and reproduced with archival inks on double-weight, acid-free paper to ensure permanence. Image size: 22″ x 14.5″.